Tracing a product's history is complicated! Like all products, the rights to manufacture and/or market nutmeg graters were often contracted, transferred, and/or sold by an original inventor or manufacturer to a secondary party of agents or manufacturers, who resold the product and/or transferred rights to a third and sometimes a fourth party. This wide range of Jobbers [SEE: A Few Definition., this page, below.] were often an invisible part of the process. Because these contractual agreements were lost or disregarded over time, they are usually absent to the modern researcher. Determining the actually inventor, manufacturer, or marketer of a product with certainty is sometimes difficult. Any remaining evidence sometimes yields misleading, incomplete, inconclusive or inaccurate historical accounts. To the reader, it is insightful to understand this problem as we attempt to reconstruct the history pertaining to the various nutmeg graters. Notice this 1888 advertisement for Wells Manufacturing Co. Ad. 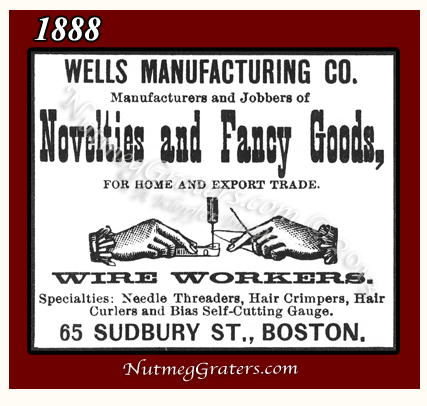 This Boston company describes themselves as both a "Manufacturers and Jobbers of Novelties and Fancy Goods For Home And Export Trade". While a local inventor may seek Wells Manufacturing Co. to manufacture his product so that this inventor can later market his own product, another company, which manufactures their own product might hire Wells Manufacturing Co. to sell their product to the export trade. In each case, it is likely that no record pertaining to the Wells Manufacturing Co. involvement would remain for a modern researcher to reconstruct a product history. In mid-nineteenth century America, the term jobber was a well known occupation which included a wide range of services. In absence of legal regulation during the 1850"s and 1870's, unscrupulous jobbers ~ who were well placed middlemen ~ could become an inventor's or small manufacturer's worst nightmare. Because "feeling cheated by jobbers" was not uncommon, by the 1890's, both governmental regulation and the creation of jobbers' associations evolved to correct these problems. Jobbers' associations were created to defend and negotiate fair business practices, usually associated to that of interstate commerce. A few of these associations are noted here. The Pacific Coast Jobbers' and Manufacturers' Association (founded 1899). The Western Fruit Jobbers Association of America (founded 1903). Southern Hardware Jobbers' Association (founded before 1907). Wisconsin Independent Oil Jobbers Association (founded in 1923). Southern Sash and Door Jobbers Association (founded in 1931). Chattanooga Automotive Jobbers Association (founded in 1934). Today, the occupation jobber is often incorrectly redefined as wholesaler. Once, a well recognized job title, the term jobber has long vanished from use. Any business or establishment engaged in selling goods, primarily for resale, directly to retailers or merchants. A purveyor of goods manufactured by others. Usually, a wholesale distributor that performs value~added work to the products that they distribute: such as minor assembly or boxing of the product. Manufacturers, tradesmen, and/or wholesalers who deal in small lots of goods; and/or manufacturing or sales jobs. One who acts as the middleman, intermediary, sub~contractor or agent, but does not usually deal directly with the retail customer. N. E. James & Co. of Brooklyn, without distinction, sold household implements they manufactured, as well as marketing those of other smaller manufacturers. Hall & Carpenter of Philadelphia, obtained manufacturer's rights for certain home goods, and paid royalty fees to the grantor. Markley, Alling & Company of Chicago, obtained manufacturer's rights for certain housewears, subcontracted their production to smaller companies. A share in the proceeds paid to an inventor or a sub-contractor for the right to use his or her invention or services. A share of the profit or product reserved by the grantor. Also called an override. A payment made for the use of property, especially a patent, copyrighted work, franchise, or natural resource. The amount is usually a percentage of revenues obtained through its use or sales.